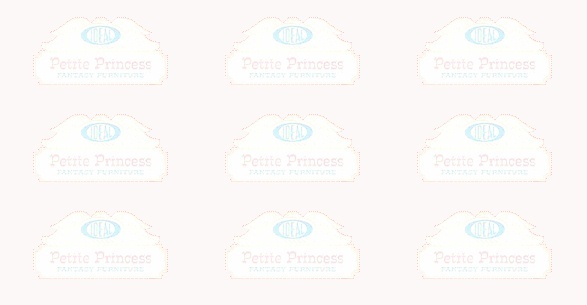 What's In The Petite Princess House? Listed below is the detailed catalog of the Original 1964 Ideal Petite Princess Collection. There were only 30 pieces in the original furniture set, with no Kitchen or Bathroom pieces offered until 1965. At that time, the Princess Patti line was introduced (for one year only), which included several additional pieces to round out the collection. The last 3 numbers of the Product Code indicates the original MSRP for each item. The number "150," for instance, indicates that the piece was originally sold in 1964 for $1.50, "200" for $2.00, "300" for $3.00, and so on. The small photos to the left of each catalog listing are called "thumbnails." Left mouse click on the thumbnail to produce a larger image of the item you desire. The images are a large, high-resolution 640 X 480 pixels in size. They may be printed individually. There's a PRINT button at the end of this listing, which will send the entire catalog to your printer. Available in various brocade and satin covers. Available in various solid colors. Available in various brocade colors. Available in various lame' colors. Available in various velveteen colors. Brass finish with rolling wheels. Shelves are removable. Includes wine bottle and 3 wine glasses. Marble finish top with lamp, flower vase, and flowers. Marble finish top with brass lamp, books, bookends. Marble finish top with brass fruit bowl, fruit, and lamp. Marble finish top, gold antiquing appointments, includes gilded framed picture. Gold antique finish. Drawers open and close. Marble finish top, gold antique finish, side panel mirrors, doors open and close. Includes gilded framed mirror, picture plate and 3 porcelain vases. Gold antique finish with decorated panels. Genuine brass 3-branch candelabra for table or mantle use. Candelabra is approximately 1.5" high. Piano panels are colorfully decorated. Top opens to reveal handcrafted genuine brass strings. Includes velvet upholstered bench, sheet music, and metronome. Genuine brass 5-branch floor stand candelabra. Genuine satin cover, hand-stitched lace trim on pillows, exquisite finishing throughout. Available in pink and blue. Marble finish top, gold antique finish. Drawers open and close. Includes gilded framed picture. Marble finish top with pink "bird" lamp. Includes gilded framed picture. French style "boudoir" phone on clear top table.